CAUTION To avoid discharging the vehicle battery, use a phone after starting the engine. Once your cellular phone is connected to the in-vehicle phone module, no other phone connecting procedure is required. Your phone is automatically connected with the in-vehicle phone module when the ignition switch is placed in the ON position with the previously connected cellular phone turned on and carried in the vehicle. You can connect up to five different Bluetooth® cellular phones to the in-vehicle phone module. 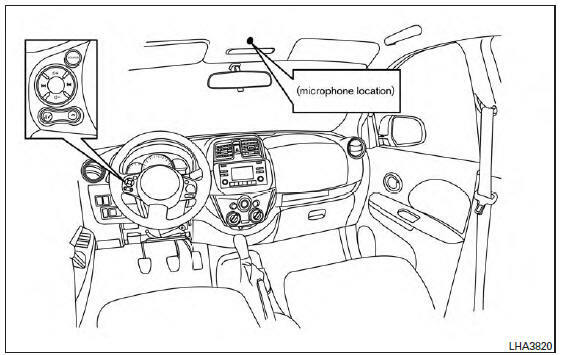 Set up the wireless connection between a compatible cellular phone and the in-vehicle phone module before using the hands-free phone system. Some Bluetooth® enabled cellular phones may not be recognized by the in-vehicle phone module. Your vehicle is in an area where it is difficult to receive a cellular signal; such as in a tunnel, in an underground parking garage, near a tall building or in a mountainous area. Some Bluetooth® enabled cellular phones may not be recognized by the in-vehicle phone module. Please visit www.nissan.ca/bluetooth for a recommended phone list and connecting.